SBG Niagara, Toronto and Scarborough were proud to host the training Camp, with coaches from SBG locations around the world coming in to share their passion and skill. We had Coaches in from Korea, Oregon, Montana, UK, Alabama, Massachusetts, Georgia, Estonia and Illinois. They made learning such a FUN time, and it was clearly evident that every participant came out of the Camp with quite a few things that helped improve their skills in every area. When you have a three day training camp that is always “hands on”, there is the risk that it can be very overwhelming, especially for newer athletes. That is never, ever the case at an SBG Camp. We had athletes from those with only a few months of experience to professional fighters that have competed in Bellator MMA , fifteen year old teens to adults in their sixties. There were training sessions in MMA, BJJ, Self Defense and Striking, and every single athlete was able to follow along, train, learn, and retain what they were taught by a variety of world class Coaches. The theme for this Camp was “connection”. It was rather fitting as from start to finish connections were made in a variety of places and ways. On the mats, it was amazing how each Coach connected their material to another, without having any knowledge of what the others were going to coach. 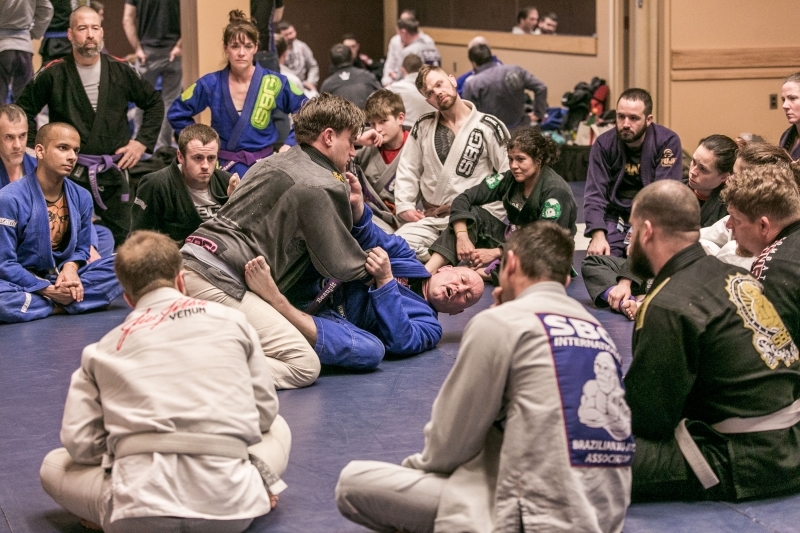 Athletes from around the world connected with each other throughout every training session, and the SBG vibe was clearly evident as seasoned athletes were seen always taking care of those that were not as experienced. EVERY Coach connected to each athlete in attendance, through their coaching, their humour and their personalities. One of the most common comments I heard from athletes throughout the Camp was how none of the Coaches ever acted like they were better than anyone else, whether it was athletes or other Coaches. World class Coaches who are humble, kind, and genuinely want to help every athlete better themselves. That is SBG. The connections made off the mats are always something special, and they make SBG Camps such a phenomenal event. Coaches and athletes sharing some great times together, whether it was a dinner out, playing arcade games, or just hanging out having a drink. SBG is known for it’s “One Tribe - One Vibe” slogan, and it is shown over and over again when we are out and about. Coaches hanging out with athletes, talking to them not just about the arts, but genuinely interested in hearing about their lives off the mats. One Tribe. One Vibe. Worldwide. SBG truly represents what I explain TEAM as: Together Everyone Achieves More. Everyone is treated as an equal, and everyone wants to help each other earn their 1% better. It truly is a special thing that we have.